The Texas Rangers (3-5) split a four-game series against the Oakland Athletics (3-5) in its first road series of 2018 at the Oakland Coliseum. 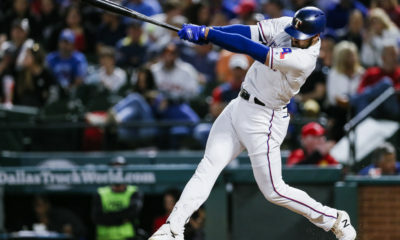 Ranger first baseman Joey Gallo drove in the lone run in the series opener when he hit a RBI single in the fifth inning. Texas lost 3-1. Ranger starter Bartolo Colon, the oldest active player in MLB, pitched six innings of one-run ball, which included a walk and four strikeouts in his Ranger debut. Then, reliever Kevin Jepsen earned his first loss after allowing two runs in 2/3 innings. Finally, lefty Jake Diekman and righty Matt combined for a scoreless 1 1/3 innings to conclude the Rangers’ pitching efforts for game one. 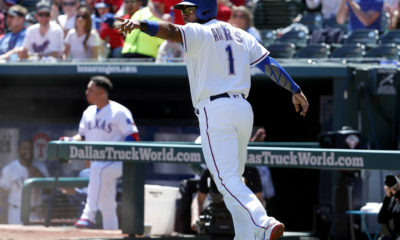 Catcher Robinson Chirinos scored the Ranger’s offense in game two with a RBI groundout in the second inning before second baseman Rougned Odor hit a RBI single. In the next inning, Gallo hit a solo home run, his second of the season. Odor hit another RBI single in the fourth to finish the scoring for Texas in game two. Texas won 4-1. Adrian Beltre’s single in the second inning of game two was his 3,053rd hit, which tied him with Rod Carew for most hits by a player from Latin America. Ranger ace Cole Hamels delivered a gem on Tuesday night, which included five innings, one run allowed, three walks and 11 strikeouts. Following Hamels’ strong start, lefty Alex Claudio pitched two scoreless innings to earn his second hold. Then, righty Chris Martin pitched a scoreless eighth to earn his second hold before reliever Keone Kela pitched a scoreless ninth to earn his first save of the season. Left fielder Ryan Rua drove in the first Ranger run of game three in the fifth with a RBI fielder’s choice. Four innings later, designated hitter Shin-Soo Choo hit a solo home run, his first of the season, to conclude the Ranger’s game-three scoring. Texas lost 6-2. Starter Doug Fister pitched 3 2/3 innings on Wednesday. 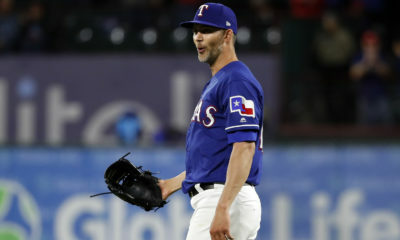 Fister allowed five runs, only two earned, walked two and struck out five, which earned him his first loss as a Ranger. Following Fister’s start, former-Athletic Jesse Chavez walked two and struck out five during 2 1/3 innings of one-run ball. Finally, righty José Leclerc pitched a scoreless seventh and eighth to finish game three for the Ranger’s pitching staff. Odor drove in the first Ranger run of the series finale with second-inning RBI single. Later in the inning, Oakland starter Daniel Mengden helped the Rangers score two runs when he threw Rua’s sacrifice bunt into past first base. Then, center fielder Drew Robinson finished the four-run rally with a RBI single. Seven innings later, Choo extended the Ranger’s lead with a two-run home run, his second. Texas won 6-3. 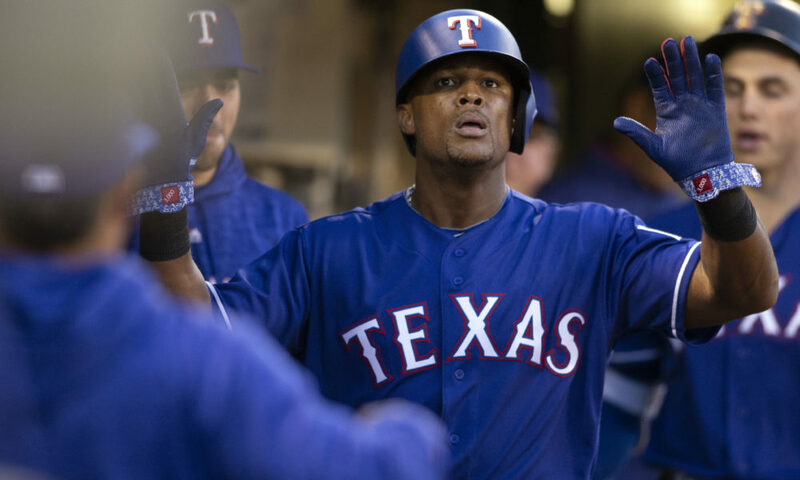 Adrian Beltre’s double, his third of the season, in the second inning of the series finale was his 3,054th hit, which makes him the base-hit leader for players from Latin America. This double moves Beltre up to 24th on the all-time hit list. 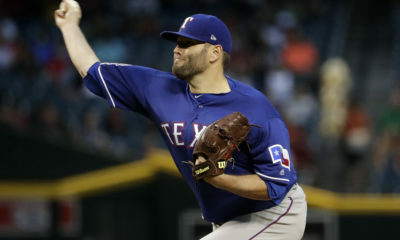 In his first start since he fractured his right elbow, Ranger lefty Martin Pérez pitched 5 1/3 innings of three-run ball, the third run scoring after he was removed in the sixth inning, which included 10 hits allowed and one strikeout to earn his first win. Then, Jepsen relieved Perez with a two-out appearance to finish the sixth. Diekman and fellow reliever Matt Bush combined for a scoreless seventh, each for their first hold. Finally, Martin pitched a scoreless eighth for his third hold before Kela earned his second save with a scoreless ninth. Leclerc was optioned to Triple-A Round Rock to make space for Perez on the 25-man roster. Texas will return to Globe Life Park to start a six-game homestand with a three-game series against the Toronto Blue Jays (4-3). Saturday- 107.9 Tulsa at 6:30 p.m.